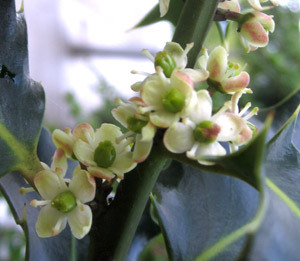 Holly is dioecious, that is, there are separate male and female plants. The male plants cannot produce berries. 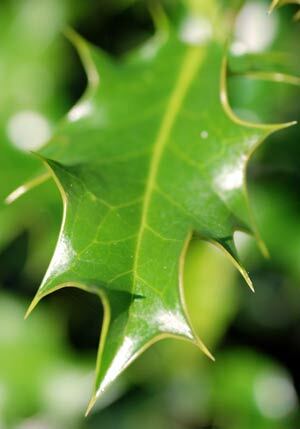 Though often seen as a shrub in gardens, holly can form a substantial tree (up to 20m tall). 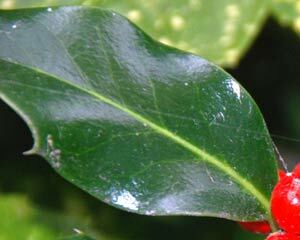 Leaves on such trees may lack the 'normal' spines associated with holly leaves. The lower leaves are likely to be browsed by sheep, cattle or deer and the spines afford some protection against such grazing. There are many variants / cultivars of Holly, some with few spines. Some hollies have variegated (green and yellow, green and white) leaves, some have yellow berries etc - furthermore, these cultivated forms may be hermaphrodite (both male and female organs). Holly can tolerate shade. The Holly has a simple leaf. The leaf margin has spines, especially on young plants. The leaves are shiny/glossy and are evergreen. They can be quite stiff with an almost leathery texture. The leaf is dark green on the top / upper surface, paler on the lower surface. 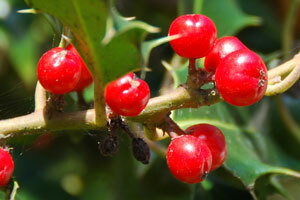 The leaves of holly contain a bitter tasting alkaloid - ilicin. It is possible that this deters many leaf eating insects. 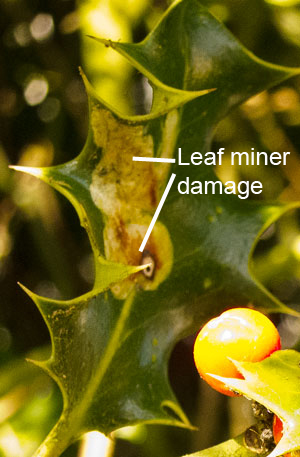 Indeed, compared to many trees the holly is not subject to sustained insect attack - though it leaves can harbour the holly leaf miner . This is the larval stage of a fly. 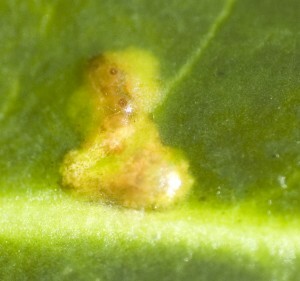 Its mining activities can cause local discolouration of the leaf - or the entire leaf may be affected though more unusual. The image below (left) shows the type of damage caused by the burrowing / eating activities of the larval stage. On the right below, is one of a "prickle-free" (well, almost) leaf - sometimes seen out of 'grazing range'. The leaves are arranged alternately on stem. 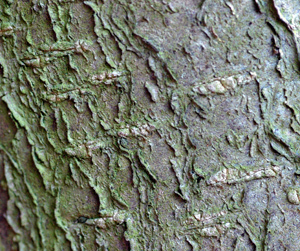 The bark is brown to silver-grey in colour. The wood of Holly was used in joinery, cabinet making, engineering, the making of mathematical instruments, wood engraving and veneering. The wood is essentially white (except for the heart wood) and accepts dyes readily - so when dyed black, it was sometimes used as a substitute for ebony (on the handles of tea pots). On the Continent, it was used in making whip handles and walking sticks. Small white flowers form in late spring, with four petals. The male flowers have four yellow stamens; they will not give rise to berries. The female flowers (when pollinated and fertilised) give rise to toxic bright red berries, each of which may contain up to four seeds - see http://www.pfaf.org. The berries remain on the tree / bush for a long while and represent a significant part of the diet of various birds. An insect associated with holly is a butterfly - the holly blue, which feeds on its berries. In the past, there were areas where Holly was abundant. For example, Needwood Forest in Staffordshire. This was a significant and ancient Midlands forest. However, the Enclosure Act of 1803 allowed for the felling of large numbers of trees; this took some time to complete. In his ‘Plant Book’, Professor David Mabberley notes that some 150,000 holly trees were taken from Needwood about this time - to provide bobbins for the cotton mills of Lancashire. Holly groves or clusters of holly were known as ‘hollins’. What was meant by a ‘hag of hollins’ is perhaps less clear. A hag can refer to an enclosure, a boundary hedge or a portion of woodland (often one ready for felling).